Grand Classic Tours Ltd will use your information to provide or manage the information, products or services you have asked for and to contact you in this respect, and may also use the information for general administration purposes, to help it improve the quality of its products and services and to carry out analysis and customer profiling. Grand Classic Tours Ltd may share your information for any of these purposes with the service providers and agents who perform services on their behalf, such as data management firms. Grand Classic Tours Ltd may also pass your information to third parties if Grand Classic Tours Ltd has been asked to provide information for legal or regulatory purposes. Grand Classic Tours Ltd may also use your information to contact you with news on cars and other products and services (provided by either Grand Classic Tours Ltd or their carefully selected business partners who provide products or services which may be of interest to you) and occasionally for market research purposes. Grand Classic Tours Ltd and these other parties, may contact you by post and phone and, if you give us your prior agreement to do so, by email, SMS and other electronic means. You can opt out of receiving communications by writing to us via the contact form on our website or by email to debbie@grandclassictours.com. Grand Classic Tours Ltd will only send you marketing communications by email or other electronic means if you give us your agreement to do so (which you may give by providing your email address: please see the notice shown when you are invited to provide your email address). You can also contact Grand Classic Tours Ltd at any time to opt out of marketing from Grand Classic Tours Ltd or, in the case of email marketing from Grand Classic Tours Ltd you have the option to click on the unsubscribe link in our marketing emails. 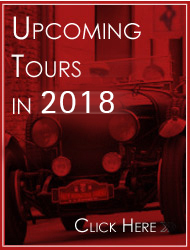 Please also contact Grand Classic Tours Ltd if you have previously asked not to receive marketing communications but would now like to hear from Grand Classic Tours Ltd with news about its products and services or anything that Grand Classic Tours Ltd consider may be of interest to you. Our contact details appear under "Contact Us" on this website. Grand Classic Tours Ltd try to keep this website secure. However Grand Classic Tours Ltd ask you to recognise when providing your information to Grand Classic Tours Ltd through this website or when you send Grand Classic Tours Ltd or ask Grand Classic Tours Ltd to send you any of your confidential information by email, that the internet and email communications over the internet may not be secure. Grand Classic Tours Ltd cannot be responsible for any loss or unauthorised interception of information transmitted via the internet which is beyond our control. to compile anonymous, aggregated statistics that allow Grand Classic Tours Ltd to understand how users use this website and to help Grand Classic Tours Ltd improve the structure of this website. Grand Classic Tours Ltd cannot identify you personally in this way. Some of our web pages may also contain electronic images known as web beacons (sometimes known as clear gifs) that allow Grand Classic Tours Ltd to count users who have visited these pages. Web beacons collect only limited information which including a cookie number, time and date of a page view, and a description of the page on which the web beacon resides. If you are under 16 please do not provide Grand Classic Tours Ltd with any personal information unless you have the permission of your parent or guardian to do so. You are responsible for informing Grand Classic Tours Ltd of any change in your details, such as a change of address. You have a right to ask Grand Classic Tours Ltd to correct any inaccuracies in the information Grand Classic Tours Ltd holds about you. You have a right to ask what information Grand Classic Tours Ltd holds about you.